I love a new release . . . even when it’s an old release brought back to life! 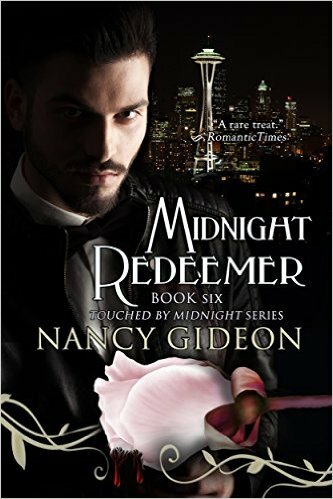 MIDNIGHT REDEEMER is reborn with its HOT new cover and updated text and ready for new readers! Before I get back to the final quarter (oh, it’s just getting too good to walk away from!) of PRINCE OF HONOR, my shapeshifter W-I-P, I wanted to share another “bite” from returning vampire, Louis . . . Protective instincts that had kept him alive for centuries surged to the forefront, demanding he take swift, unwaveringly brutal action to guard his secret from further exposure. Exquisite agony pierced through his gums as necessity and need combined. He’d been hungry for her from the very first, and now had an excuse to lose control. He could smell her fear entwined intoxicatingly with her femininity. Expectation brought the anticipated taste of her to whet his lips. His muscles coiled with predatory intention, until logic slapped the urges from him. If she knew who and what he was, why was she here? Curiosity reined in his hunger and quieted the defensive panic. Why place her life in peril unless the risk was worth the potential gain? Don’t eat that – you’ll regret it later! Don’t you hate it when logic gets in the way of a good snack? During their conversation, the restaurant had made an entire revolution, the brightness of the Seattle cityscape becoming the opaqueness of the bay, and against that flat black mat, the restaurant’s interior shown clearly upon the glass. All, that is, except for Louis Redman. His chair was empty even though he occupied it, the glass of wine lifted as if by its own accord, though she could glance at him and see he clearly held it in his hand. The shock startled all else from her mind. This was no casual date, and she wasn’t certain Redman was even a man. There was a sudden flicker of light as Louis lit the candle centerpiece on their table. Even the small flame obscured the reflective quality of the windows. But Stacy could not forget what she’d seen . . . or what she had not seen. He didn’t photograph, and he had no reflection. Nothing particularly new in the vampire realm, but what excited me all over again was the visual way the mystery and interactions played out . . . like a series on cable. I could see it so clearly: The settings, the cut away shots, the flash back sequences to incorporate the historical precursors, the close-ups, even the special effects. Hmm. Maybe it's time to brush off those screen writing skills. Or maybe I need to take a break from the CW Network and get back to my W-I-P! Have you had projects of yours just screaming out for TV/movie treatment? Pitch me your High Concept! After dancing around the main characters’ long ago connection in PRINCE OF HONOR, my paranormal W-I-P, for months of sneak peeks, I thought I’d let you get a glimpse at how two such opposites could possibly come together with so much baggage pushing between them. It started with that first awkward, never forgotten experience . . . a kiss. On the cusp of awkward maturity, he’d felt those stirrings of hot-blooded adolescence and curiosity that were the mainstay of conversation amongst his brothers. While Wesley, Stephen, Rico and Colin boasted of salacious and probably highly exaggerated sexual exploits, his cheeks burned and his imagination prowled as he lingered on the outskirts of their discussions. It was then Wes’s half-sister Sylvia appeared, a provocative early bloomer inflaming their imaginations with her barely-there skirt, twitching stride and bold interest in their attentions. As she’d strutted by, pretending not to hear their lusty speculations, Stephen, a bully even then, gave Turow a hard push in her direction, loudly goading him to make a move. Horrified at becoming the focus of attention, especially when hers turned his way, he froze, earning whooping laughs and ridicule from the others. It was the worst moment of his life . . . until the goddess he adored from afar changed everything about it. Without a word, she sashayed up to him, taking his hot face between cool hands and pressed her lips to his. When his jaw dropped, her tongue intruded. Tongue! The others stared, astonished and envious to think the quiet, bashful one amongst them would be the first to actually claim that coveted experience. Could anything be worse than adolescent love? Can you still remember your first clumsy, to die for encounter? Of course you can! Mine was immortalized in PRINCE OF SHADOWS. Sigh . . . It’s something you never forget: Those circumstances, that object of desire, the burst of feelings. But in the case of Turow and Sylvia, will the foundation of that innocent moment be enough to sustain them through the doubts and drama to come? Happy Spring! Happy Writing, fellow Warriors! 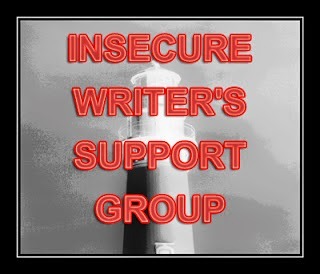 IWSG: It’s Never Beyond Repair! I was able to make a trip back to my hometown two weekends ago to spend some time with my son, d-i-l and grandson. It was my first visit back since an abrupt and distressing move across the state just before the holidays. Besides seeing author friends and spending quality time with the family, I discovered something very important in relation to my writing life. This handsome lad is my eight-year old grandson but he’s not the lesson. It’s the pasty, fowl looking fellow behind him. I inherited my mother’s porch goose some 15 years ago. Though I wasn’t particularly fond of it, I enjoyed the creative process of dressing it up for the holidays as a reminder of her. When it followed me to my apartment, there was no place to display it so it was tucked away in neglect on my third floor patio. I didn’t think much of it until 300 pounds of ice slid off the roof and crushed my patio chair and broke the goose’s neck. Poor thing with just a piece of heavy gauge wire holding severed head at an unattractive angle. When my sudden move came up, no one wanted to carry that heavy piece of damaged statuary down three flights of stairs, so the once proud family mascot was left behind. 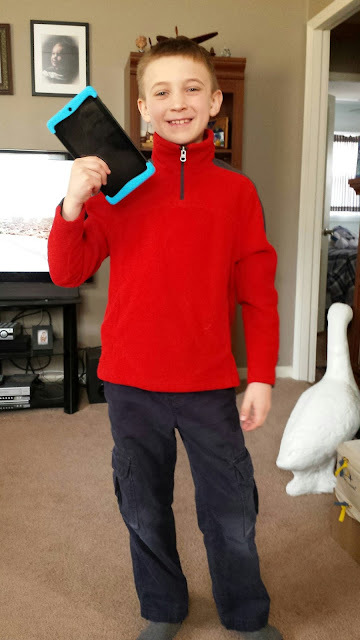 Until during my visit my son surprised me with Mom’s goose, neck replastered and good as new. I’d given up on my feathered friend too soon. Lugging porch goose back to my new home, I was filled with nostalgia and excitement. It had taken the caring handiwork of my son to show me that I’d given up on something I’d once loved prematurely. All it took was a little TLC from another to make me appreciate it again. It made me think of something else I’d dragged across the state, boxed and nearly forgotten. Those fragments of stories, those submitted, rejected and never retooled manuscripts I’d given up on, the long out of print books I had the rights to but never did anything with. Maybe I gave up on them too soon. Maybe it’s time to reevaluate their worth, to spruce them up, let others take a look at them to help me fix problems I thought irreparable. What have you given up on and tucked away, thinking there was no point in trying to save it? It’s time to take it out, boot it up and see if that original spark fires again. Make spring cleaning into a time of creative rebirth. IWSG awesome co-hosts for the March 2nd posting will be Lauren Hennessy, Lisa Buie-Collard, Lidy, Christine Rains, and Mary Aalgaard!